Thanks to Jacob Gitter, Ladies Tech Ed is here. This new high school club offers girls a chance to try their hand at some of the traditionally male-dominated classes, such as welding, basic auto-maintenance, auto-emergency, woodworking, and screen-printing. The club started Oct. 20. 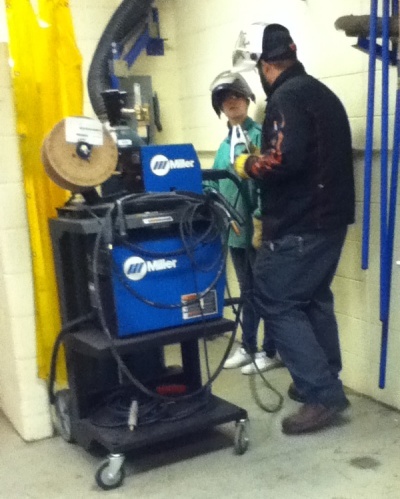 Jacob Gitter teaches a student how to weld. Originally thought up last year, Ladies Tech Ed has been a work in progress. Gitter, a tech ed teacher at East, was “the brains” of the operation, ironing out and fine-tuning all the details. “We’re trying to increase your non-traditional enrollment, so not just the boys. I don’t get a lot of girls [in courses], and when I do, they’re very successful but nervous taking the class because of the boys,” Gitter said when asked why the club was intended for ladies only. This after-school activity isn’t just for students, but staff members as well. Dawn Cox and Ann Jacoby, two aides at WBHS, were some of the first participants. “It’s a new experience, and you never know if you are good at something unless you try,” Jacoby said about why she went to the club. The club appeared to be a crowd-pleaser. “I enjoyed it and plan to go to the other topics Mr. Gitter offers,” Cox said. “After we were done, I was pleasantly surprised! 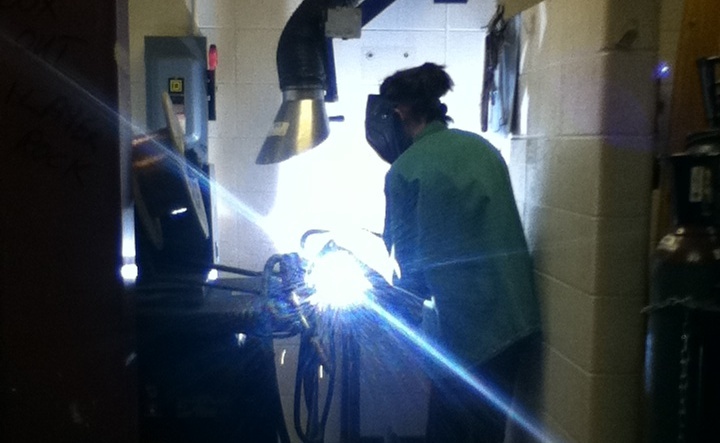 I learned how to weld in roughly two hours; most people can’t do that!,” said Krystle Hader, a West sophomore. By meeting two or three times per month, Gitter hopes Ladies Tech Ed will see increased participation and get girls interested in all the tech ed classes.